Having problems with productivity? Maybe your workspace is the issue. If you like me, sometimes you find you're not as productive as you like to be. When that happens, there are a few things you can do to get back on track. Of course, we want to start with checking ourselves. Have you been eating have you been sleeping? Have you been getting enough exercise? Is there some extra stress that may be keeping you distracted? After we've checked all these things though it might be time to look at our environment. There is the cliché of course that a messy desk reflects a messy mind; however, it's a cliché because there's some truth to it. Here are my top three recommendations for clearing your space and clearing your mind. Get some elbow room. If you don't have enough space, you're more likely to have a lot of clutter, which contributes to the problem. It's tempting for us to say that we can work in a tiny space in the corner of our room. The truth is if you don't feel comfortable you're not going to get much work done. Make sure you have adequate space for your desk, computer equipment, phone, and files. It doesn't mean that you need to have a massive space. Just make sure you have enough space to do everything you need to do and feel good about doing it. Need a shift in your productivity? Clear the clutter. 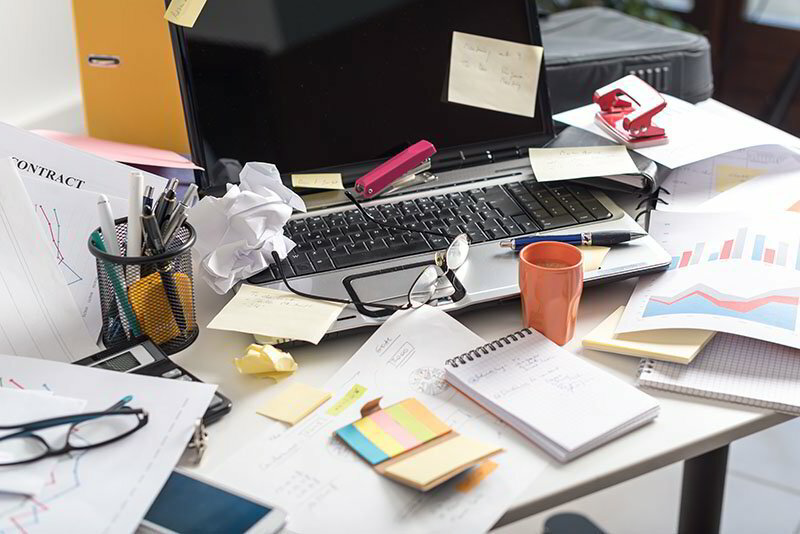 Go through every piece of paper on your desk and either file it or throw it away. There are some things that you need to deal with right away. Put those items into a “do now” folder. Other items are probably project related. Create a folder for each project, label them carefully with the due date, and place them in your standing file holder. You can probably throw everything else away. Be brutal. If you don’t need to act on it, it’s probably safe to toss it. Set your boundaries. We all slip up and go out to grab an extra coffee, have a quick chat with a friend, or post to Twitter. But it's important to make sure that everybody knows that work time is work time. Establishing boundaries sets the tone for a productive workday. That might mean putting a sign on the door to let your family know you're working and can't be disturbed. It might mean putting your mobile phone on do not disturb and only taking business calls during working hours. Explain to friends and family that even though you work from home, you are working. Most importantly, stick to the rules you put into place. Taking the above steps should help you to clear the clutter, clear your mind, and be more productive.